Cora Sharp is no stranger to cows and has been showing since she was nine-years-old. 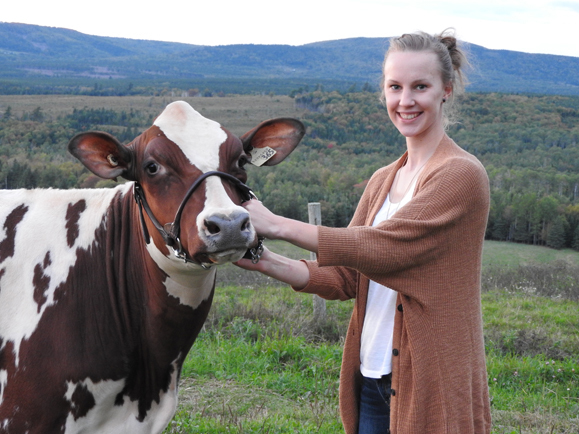 A third-year Environmental Sciences student from Sussex, New Brunswick, Cora grew up on a dairy farm milking 60 cows in a tie stall barn using eight milking units. 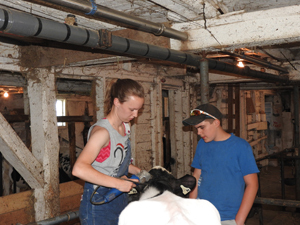 Cora joined the Sussex Holstein 4H Calf Club and began showing when was nine-years-old. Since then she has shown both dairy and beef. This year she was able to compete in the overall showmanship class where she tried her hand at showing horses, chickens and rabbits. “Many, many hours go into training a calf when preparing for a show,” explained Cora. “I trained mine five-days-a week if not more. It's important to know the heifer you're training so you can show off her strengths and hide her weaknesses. I washed her lots and clipped her quite a few times. I got people to watch me walk my heifer so I knew how she looked as she was moving,” she added. Cora is attending The Royal again this year with her sister Sophie acting as Alternate for the NB Royal Dairy team. "I’m showing in Senior Showmanship class and in the colour breed class. Both days start at 8am, " said Cora "This year my sister Sophie is our alternate and she is in the exact same shoes as I was last year so I am able to help her out." I learned that flying isn’t so bad, the city isn’t for me and I learned a lot about team work and how to get things done efficiently! I’m looking forward to the really good food but I’m mostly looking forward to actually getting in the ring this year instead of watching from the sidelines. Cora has a busy study break competing in two national competitions. "When I get back from The Royal I’m going straight to Halifax to join my soccer team at the CCAA national soccer tournament that we are hosting," she explained. "Competing in two nationals competitions in one week is probably the best but most stressful way to spend my study break! Cora has always loved animals and wants Dairy farming to be a big art of her future. “I want to use my degree and my passion for agriculture to some day have my own farm,” she said. This is Cora’s second trip to The Royal having learned a lot from her 2016 trip. "I learned that flying isn’t so bad, the city isn’t for me and I learned a lot about team work and how to get things done efficiently, she explained. "I’m looking forward to the really good food but I’m mostly looking forward to actually getting in the ring this year instead of watching from the sidelines."